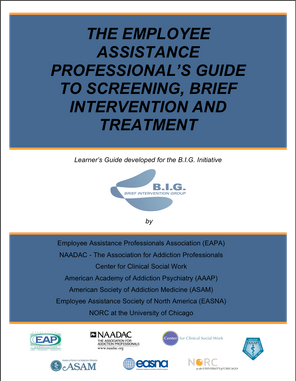 The EAP and Behavioral Health Professional’s Guide to Screening, Brief Intervention and Treatment is a 200+ skill-based training manual on SBIRT (Screening, Brief Intervention and Referral to Treatment). This Learner's Guide brings together the tools that employee assistance professionals (EAPs) and other helping professionals need to screen clients for unhealthy drinking, deliver effective brief counseling, refer and co-manage with addiction specialists for EAP clients with serious problems and provide successful case management and follow-up. Provide follow-up and recovery supports to help clients to remain productive at work. Apply SBIRT techniques to other client concerns such as depression, anxiety disorders, drug use, medication misuse and tobacco addictions. This Learner's Guide is designed for the real world. The program uses video and audio models of EAP situations, role play, and feedback so that clinicians can learn and practice new skills. The program has many brief, 2 to 4 minute web training videos that show both appropriate and inappropriate SBIRT techniques. The video examples use typical EAP situations in which the clinician can see counselors like themselves working with EAP clients who have alcohol and drug problems. Supplementary materials such as questionnaires, practice scripts, clinical tools, research articles, and links to additional training resources are provided. Appropriate for employee assistance professionals, addiction professionals, social workers, mental health counselors, professional counselors, psychologists and other helping professionals that are interested in learning about SBIRT. The Learner's Guide is available for purchase for $25. Bulk discounts are available. View a Sneak Peek of this manual or purchase online.